(all complete HTML texts here) as well as many other romances, tales, and sketches. This WWW site is dedicated to enhancing our understanding and appreciation of Hawthorne's writings and life. NEW: what is new at Eldritch Press--keep in touch via one central page. 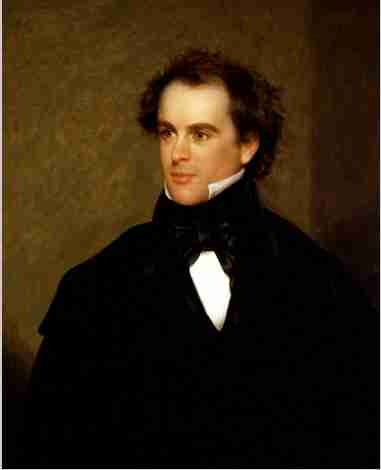 The bicentennial (200th) anniversary of Nathaniel Hawthorne's birth was held July 4, 2004, in Concord and Salem, Mass. The Internet Archive Bookmobile, sponsored by the Internet Archive and Anywhere Books, to mark the occasion printed out free copies of a new compilation of works pertaining to New Hampshire, "Hawthorne in New Hampshire," which you can download from this site (CAUTION: 16MB!). For an explanation of the Bookmobile, see the file flyer.txt. NEW: We have dedicated all our work here to the public domain under a deed available from Creative Commons. (Except for "The Wayside: Home of Authors," held by heirs of the author.) This supercedes all our previous copyright notices. NEW: Notes in England and Italy , by Mrs. Hawthorne, 1869, 1871. These extensive notes go along with the works mentioned below. NEW: Passages from the French and Italian Notebooks of Nathaniel Hawthorne , as edited by his widow, 1883 edition, are online. NEW: Passages from the English Note-Books of Nathaniel Hawthorne , as edited by his widow, 1870. Caution: one big (1.2MB) file! The Nathaniel Hawthorne Society celebrated the 150th anniversary of The Scarlet Letter in 2000, and will be celebrating Hawthorne's bicentennial in 2004. This site has no official relationship with the Nathaniel Hawthorne Society, but we urge you to join. North Shore Community College, Danvers, Massachusetts, is planning a large public web site on Hawthorne in Salem, funded by the National Endowment for the Humanities. A call for papers and other assistance has been issued by Professor Terri Whitney. See the "Hawthorne in Salem" site. NEW: Our Old Home: A Series of English Sketches (1863) in 1883 edition [719572 bytes] or in ASCII text [679373 bytes] or ASCII text zip file [273497 bytes] or compressed file of HTML with pictures [378274 bytes] format. NEW: The Wayside: Home of Authors , by Margaret M. Lothrop, is once again available, now we have secured permission from the copyright holder. NEW: The Trustees of Reservations finally has a page on The Old Manse. Concord.org also has an attractive new site on the Manse. NEW: La silla de abuelo -- translation of Grandfather's Chair into Spanish--traducion en español. A new edition of this translation is in progress. Contact J. D. Lopez Evans. NEW: Passages from the American Note-Books, as edited by Sophia Hawthorne, 1868, 1883. Fun introduction! Did you know that we have discovered the original sound recordings that Hawthorne made during his life, with the most modern equipment and most powerful computer available to him ;-)? See our old page, An Audible Stillness. Check out our new color illustrations to The Scarlet Letter . (A new window will open--keep it open while you read the text.) We ask only this--if you enjoy viewing these beautiful pictures, think about readers who are blind or have visual difficulties which make them impossible to see. You can make these pictures accessible to them by helping write text descriptions we can place online. Please email your work and we will give you credit. See the first few for examples. If you like illustrated books as much as we do you will also enjoy "Howe's Masquerade" with many illustrations (be patient). It has been on this site for years but most readers miss it. Please visit the excellent site on the only home Hawthorne owned, The Wayside, now property of the U.S. taxpayers. We now have new pages for The Scarlet Letter . We have finished the glossary and many notes for all chapters, at last. We expect to revisit this book and supply a better bibliography, if we can get copyright permission to do so. If you earlier downloaded this text, please grab a new copy, since the edition here as of 1999-10-01 has fixed many many errors. Please let us know when you find typos! The Scarlet Letter Essay Contest has been cancelled. We no longer maintain a discussion page. We can neither answer queries nor help with student assignments. "Boston in the Sixties" from Bits of Gossip by Rebecca Harding Davis, 1904. Passages from the American Note-Books, edited by Sophia Hawthorne, 1868, 1883. Memorial poem by Longfellow, 1864. There is a page on Julian Hawthorne, dwelling on spiritualism. The Wayside: Home of Authors by Margaret M. Lothrop, 1940, includes much biographical information on the Hawthorne family when they lived in this historic house. Expanded list including tales and book tables of contents, or just the tales and sketches in the order of first appearance in magazines, or the works in alphabetical order. Some of the Hawthorne Family papers, including those of Rose Hawthorne and Sophia Peabody Hawthorne, are at Stanford, Department of Special Collections, Green Library. University of California at Berkeley, Bancroft Library has a collection of Julian and Nathaniel Hawthorne papers. The Pierpont Morgan Library and Museum at 29 E. 36th Street and Madison Avenue, New York City, has almost all of Hawthorne's existing manuscripts. Drop in and help them get them online! Read the best of the humanities on the web. This Nathaniel Hawthorne web site has been selected as one of the 20 best humanities web sites on the World Wide Web by EdSITEment. EdSITEment is a joint project of the National Endowment for the Humanities, the Council of the Great City Schools, MCI Communications Corp., and the National Trust for the Humanities. The project has engaged professional teachers to write a teacher's guide to this site. We are amateurs and have no other relation to these groups nor receive any financial support. Please follow the link for more information. The Discovery Channel on cable or satellite television, available at many schools, is featuring The Scarlet Letter among its Great Books programs. Teachers should visit the Discovery Channel School web site for information that might be helpful for teaching this great novel. NEW: video documentary, "Neighbors in Eden," the lives, works, homes and hometowns of Emerson, Thoreau, Hawthorne and Dickinson, for sale by Jack Hussey, Fairmont State College, Fairmont, W. Va. The economics of book publishing -- Ticknor and Fields, the popularization of literature, and the glorification of the American author (see this:) American Literary Publishing in the Mid-Nineteenth Century : The Business of Ticknor and Fields (Cambridge Studies in Publishing and Printing History, 1995), by Michael Winship, ISBN: 0521454697. Sociology and economics: what was Hawthorne's criticism of socialism, anarchism, and the abolitionists? Why isn't the sea made of lemonade? Audio versions, adaptations, other materials. At last! T-shirts, sweatshirts, posters, bookplates, mugs custom printed with Nathaniel Hawthorne portrait! (Also Melville, Wharton, Twain.) No web address, but call +1 800 958 3633 or +1 413 684-4077, Peter Drozd Graphics arts, 117 Carson Ave., Dalton, Mass. 01226. Tell Peter we sent you. Use a $0.20 United States Postal Service postage stamp featuring a portrait of Nathaniel Hawthorne. Node for The Scarlet Letter at Everything University is a neat do-it-youself hypertext literature reference. Hawthorne College in Antrim, N. H., existed from 1962 to 1988, but lives on in the memory of its alumni and former teachers. Ever wonder about the relation between Hawthorne and Mt. Everest, Neil Simon, Lionel Trilling, Rube Goldberg, MGM, Cal Coolidge, Meyer Lansky, and Henrietta Leavitt (the Cepheid variables astronomer)? They were born on the Fourth of July. Fame: do more people celebrate on Hawthorne's birthday than celebrate on John Lennon's? During the 1996 U.S. presidential election campaign, Pat Buchanan put online Hawthorne's impression of Abe Lincoln, considered almost treasonous at the time. We have the full version, "Chiefly About War Matters." Coincidentally, "Hawthorne": Did you know that Hawthorne, California, next to Los Angeles International Airport, was the home of Marilyn Monroe, the Beach Boys, and Mattel's Barbie doll? Okay, you knew that. But did you know that Hawthorne, Nevada, is next to the world's largest ammunition dump outside Russia? Will the insurance companies select this as the site of Earth's Holocaust? More coincidences: Hawthorne's daughter, Rose, died in Hawthorne, New York, on his wedding anniversary. That Hawthorne, New York, is also the the home of one of IBM's Westchester installations. Hawthorne's "lost notebook" was found on Hawthorn Avenue in Boulder, Colorado. The "Hawthorne effect" is a much-discussed area of industrial relations, psychology, or sociology. It has to do with a series of studies done at the Hawthorne Works of Western Electric in Cicero, Ill., in the 1920s. The conclusions seemed at first to mean that industrial productivity did not relate directly to the level of electric lighting. But this later appeared to be a spurious result or side-effect of the research lacking proper experimental control-- the workers instead seemed to increase work with any meaningful human attention, much more than with increases in lighting or wages. Isn't all this stuff overwhelming? Give me instead a few quotes or a sort of introductory page to get me started. Whatever it is I am looking for, I haven't found it here, but will search elsewhere for it. Eldred, Eric. Nathaniel Hawthorne (1804-1864) Home Page. Derry, N.H.: Eldritch Press, 1999. 12 Oct. 1999.